The dolls with a heart are back! Raggedy Ann and Andy have long time been one of my favorites as I have collected dolls, books and more over the years. I still have a photo somewhere of me carting around a Raggedy Ann doll that was larger than me at age 3. A new, yet vintage like doll to continue the tradition! I certainly haven't outgrown Raggedy Ann and I hope my daughter never does either! These dolls are designed for ages 18 months and up. Made with the looped yarn hair as is tradition, these dolls range from 8 inch to 25 inch in size. The prices ranges from $10 to $35. The Fancy Pals design has a small 7 inch doll in a darling little carry purse and sell for $17. Raggedy Ann or Andy doll!! RAGGEDY ANN and RAGGEDY ANDY are trademarks of Hasbro and are used with permission. (C) 2012 Hasbro. All Rights Reserved. RAGGEDY ANN AND RAGGEDY ANDY were created by Johnny Gruelle. Raggedy Ann.. I have owned one for almost 40 years, since I was a baby!! I love teh 25" Raggedy Ann Classic in X Large - with my child, the bigger the better! I like the butterfly fancy pal! my son would LOVE the medium andy 12"
I love the x-large raggedy andy! I grew up with these and just love that they are still around!! I like the Andy doll. I love both Raggedy Ann and Raggedy Andy. I remember them from when I was very little. 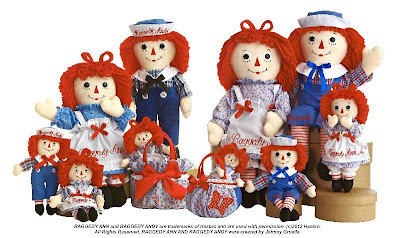 I like the 12" RAGGEDY ANN CLASSIC - MEDIUM! I love the Raggedy Ann dolls. I also wanted to thank you for having this contest open to Canadians. It is appreciated!! My favorite is the 7" RAGGEDY ANN FANCY PAL - BUTTERFLY. I like the 16" Classic raggedy Ann Doll!